Bill Nye the Science Guy Passes Out "Like Lady Gaga"
During Bill Nye's lecture at USC this week, he fainted and compared himself to Lady Gaga. Concern is in the air today for the well being of Bill Nye, the man known primarily as the Science Guy. While lecturing at USC about global warming, Nye collapsed. Reports say that Nye fainted from exhaustion, and not a drug and alcohol-fueled night of insane craziness. Nye may have been thinking too much about the world's health, and not enough about his own. 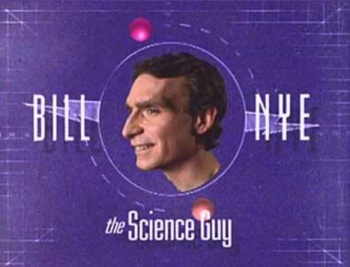 Nye became popular thanks to Bill Nye the Science Guy, a kids television show than ran from 1993 to 1998 which was sort of like Mr. Wizard, but with more humor and without those creepy helpers. It made science entertaining enough for kids that had just finished watching Teenage Mutant Ninja Turtles, and had an intro that could have been written by C&C Music Factory. When Nye recovered, he reportedly said: "What happened? How long was I out? Wow, that was crazy. I feel like Lady Gaga or something." Don't worry Bill, we know you were probably just really tired. Nye still finished his lecture for the hundreds in attendance, albeit sitting in a chair. The L.A. Times reports that the response by many in the audience wasn't to help Nye, but to update their Twitter accounts with news of what had happened. Thankfully, Nye was okay, but seriously, how about leaving Twitter behind for once when Bill Nye needs help? There's only one Science Guy, and the world needs him.